For nearly two decades, SALON TODAY has taken the pulse of salon and spa business through our Salon Today 200 competitions. Each summer, applicants across North America painstakingly fill out pages of detailed questions about every aspect of their business and craft 1,000-word essays in up to 11 different competition categories. Over the fall months, our team dives in, reading and scoring each application, tabulating data, determining the list of honorees and profiling each salon or spa. As we ring in the New Year, SALON TODAY wraps up the result of all this work as our gift to the professional beauty industry—a comprehensive sketch of the current state of salon and spa business. The data we derive establishes important annual benchmarks, allowing the owners of salons and spas of all sizes a barometer by which they can measure their own success. The best practice ideas shared by the honorees spark new thinking among owners and encourages them to share their own success stories. And, the candid and spirited pictures draw readers into a special community developed exclusively for those tasked with managing a thriving salon or spa business. As you prepare your own business for New Year, we proudly present to you the 2015 Class of the Salon Today 200. By studying the composite data from all 200 honorees, we sketch a rendering of what the average ST200 salon looks like by showcasing the averages of the entire group. A PRE-TEEN: The average ST200 salon opened its doors in 2004. The higher the revenue the salon brings in, the older it tends to be. The median year opened for salons grossing $2 million or more is 1996, while those with revenue less than $500,000 have a median opening date of 2006. A PARTY OF ONE: About three in four of the ST200 have only one salon location. Of those that do have more than one location, on average, they operate three sites, slightly fewer than what was reported last year. RENTING: At 81%, the majority of the ST200 honorees lease their real estate, up slightly from last year. NEARLY TWICE THE AVERAGE U.S. HOME SIZE: The typical ST200 salon occupies an average of 5,220 feet. (According to the U.S. Census Bureau for 2009, the average U.S. home size was 2,438 square feet.) Although size varies depending on where you’re located. Salons in the Midwest are significantly larger than those in the West ---6,500 square feet versus 3,800 square feet. A SALON AND SPA. At 99%, almost all of this year’s ST200 consider themselves to be a salon and spa. SEEKING COUNSEL. At 47%, nearly half of the ST200 have hired a salon coach or consultant in the past three years. IS CONNECTED. Two-thirds—67%--of the ST200 belong to one or more industry associations, although the number of affiliated salons has declined slightly from last year. Popular choices are the Professional Beauty Association, National Cosmetology Association, Intercoiffure, and Cosmetologists Chicago. KEEPING BUSY. Among the ST200, the average number of transactions in the last year is 27,357—that represents a 6% increase over the average number of transactions from last year’s honorees. UPSELLING. Roughly, the average transaction by the ST200 is $75.10, which is up by 7 percent over last year. The average price charged for a shampoo, cut and style is $50.68, while the average price charged for a single-process color is $70.98. A GOOD EMPLOYER. The average number of total employees for the ST200 40, which in an increase of about 3 employees per salon over the past two years. DEVOTED TO CUT AND COLOR. Despite the fact that almost all of the 2015 honorees consider themselves a salon and spa, their revenue is strongly supported from hair-related services. When you break down the average ST200 salon’s gross revenues, 35% are comprised by hair color services, 32% by hair cutting service sales, 18% by retail sales, 7% by spa-type service sales (including skincare and bodycare), 3% by nail services sales, and 2% by chemical service sales. PROTECTING ITS ASSETS. Nearly half—48%--of this year’s ST200 have a non-compete or non/solicitation agreement in use with team members. This is up from 44% last year. PAYING OUT FOR LABOR. When you look at a ST200 salon’s total budget, the largest expenditure continues to be for labor costs at 48%. Other significant expenditures include supply cost at 11%, rent/mortgage at 7% and taxes at 5%. Of the average ST200 budget, 7% is profit. Among the ST200, 64% of the owners continue to perform client services. Of those who do, owners spend an average of 25 hours a week performing services – the same as last year. Owners of ST200 salons/spas on average review two Key Performance Indicators to assess their health of their business—productivity (26%) and average ticket (20). Salons with revenues between $1 million and $1.9 million were more likely to put emphasis on client retention of existing clients, than owners of salons bringing in less revenue. ST200 owners fell they have the least control over the expense areas of inventory and shrinkage, as well as the cost of service supplies, including the backbar and haircolor. The costs they feel they have the most control lover are retail commission, service and non-service payrolls, and education and training expenses. When asked what keeps them up at night, owners listed the inability to reduce expenses and keeping their staff busy are the top two reasons. Other areas that cause owners concern fall into four areas: providing motivation and career paths for staff; determining how to grow third business; how to find good people and how to better manage their own time. About half of owners (53%) set up an annual budget for salon improvements, and of those who do this amount represents 2.5% of the overall salon budget – which is down from last year’s 3.3%. Three in four of the ST200 salons order their retail products once a week. Salons with lower growing revenues are more likely to order retail less frequently at twice a month. The majority of ST200 owners keep a tight rein on product—counting and adjusting their inventories either weekly or monthly. By reviewing historical data from the past six ST200 competitions, we are able to paint a broader picture of national trends for the professional beauty industry. For the very first time, average gross revenue for the ST200 salons eclipsed $2 million, with the average for 2015 (which compared sales between calendar years 2012 and 2013) reaching $2,054,411. 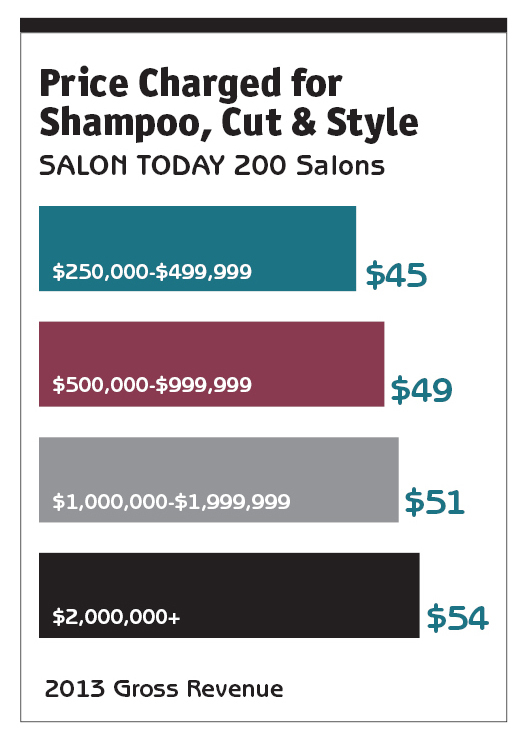 By comparison, in 2010, salons posted an average $1, 665,000 in sales. In addition, the average charge for a shampoo, cut and style tipped over the $50 mark to $50.68. In 2010, the average price was $48.75, and it dipped in 2012 to $46.66. At the same time, growth rates, at 13%, slowed to rates closer to the recession years. Most likely, that’s because the post-recession rebound caused growth spikes of 17% in 2013 and 19% in 2014 that were inconsistent with growth rates in normal year.